Finally got the laptop back after a week. Phew! Kung po or kung pow chicken (gong bao ji ding 宮保雞丁) is probably the most famous Sichuan chicken dish outside China. It is listed in nearly all Chinese restaurants or takeaways menu worldwide. 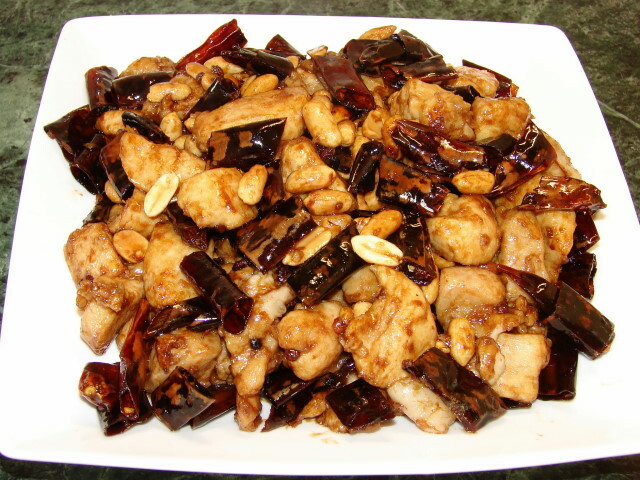 There are many versions or westernised kung po chicken, many include diced vegetables and most used cashew nuts. The real Sichuanese style has few ingredients include chicken and peanuts with Sichuan peppercorns and plenty of dried chillies to flavour the chicken. 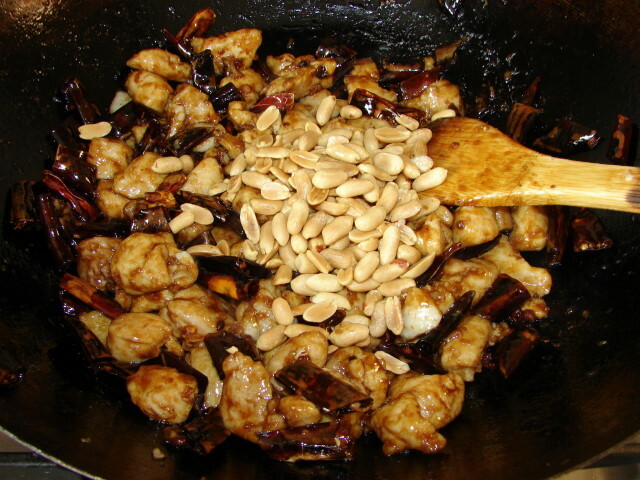 This dish was said from a Xing dynasty official with the title 'Gong Bao (宮保)', the recipe was created by Gong Bao's chef. Here is my version of the recipe as close to the Sichuanese style as I know. Oil velveting the chicken pieces. Then drain on paper towel to remove excess oil. 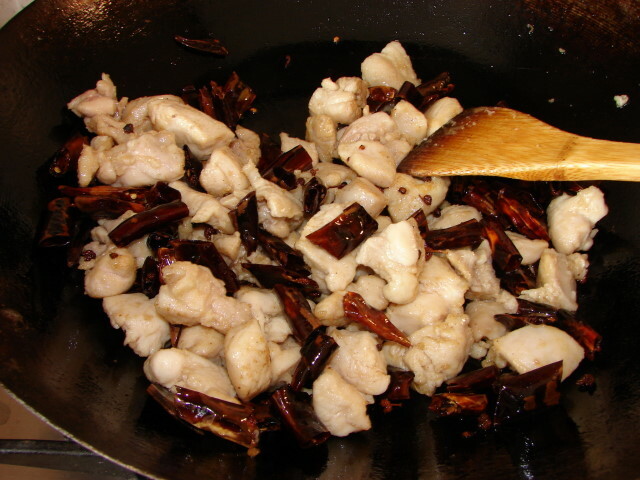 After frying the chillies till very dark brown add garlic, ginger and chicken pieces. Cut chicken into small pieces and mix with the marinade. Leave aside for 15 - 30 minutes. Most recipes will use the peppercorns dried. I like to soak them with 2 tbsp of boiling water for 5 - 10 minutes. This helps to prevent the spice from burning when frying with oil. Soaking I find really brings out the flavour of the peppercorns and soften them. I don't mind leaving them in the dish. Normally if the peppercorns are not soaked they are like biting lead pellets, quite unpleasant. Do not throw away the soaking liquid, this has plenty of flavour. 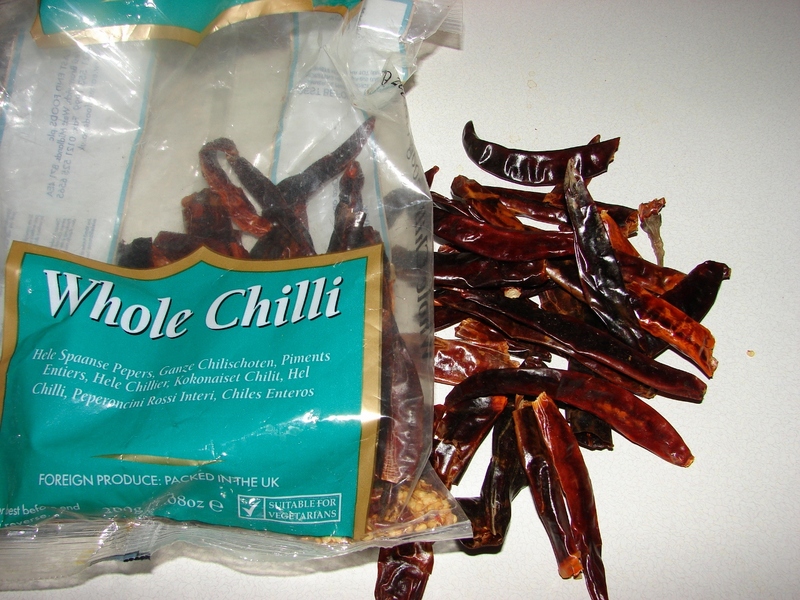 Rinse whole dried chillies, shake off excess water. Cut chillies with scissors into small pieces and remove the seeds if there are many. Rinsing the chillies will bring out more flavour and prevent burning when frying with oil. Dampening the chillies is something I have T&T and I find this very useful. Mix the sauce ingredients and peppercorns soaking liquid together. Heat oil in wok till medium hot. Drop in all the chicken pieces, stir and cook the chicken for about 1 minute or till chicken turned white. Do not let the chicken turned brown. This process is called oil velveting, most popular method used by Chinese restaurant to keep the meat really moist. Get ready a large bowl and large sieve. Put sieve on bowl. 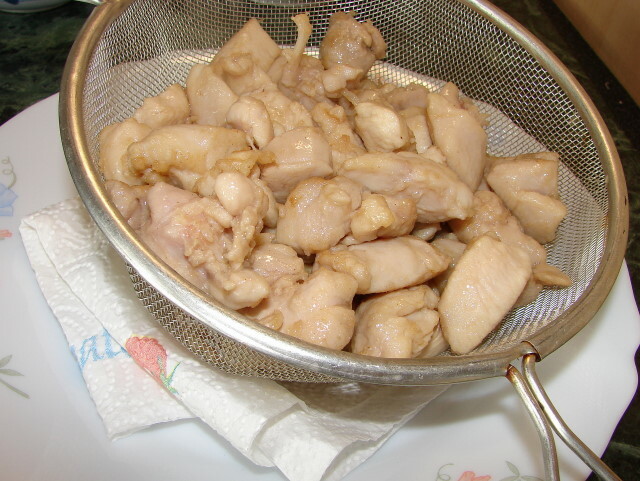 Pour oil and chicken through the sieve, collect oil in bowl. Put sieve and chicken on several layers of paper towel to absorb excess oil (see picture). Put about 3 - 4 tbsp of the meat frying oil into wok, add Sichuan peppercorns and chilli pieces. Fry at medium to medium low heat till fragrant and chillies turning very dark brown in colour. The fried chillies will give a nice smoky flavour to the chicken. If you don't like biting into Sichuan peppercorns fry them first till oil is fragrant. Remove peppercorns then fry chillies. Stir in the chopped garlic and ginger, give this a quick stir. Add chicken pieces. Stir for couple of minutes till heated through. Add sauce mixture. Stir till sauce is absorbed. Stir in handful of peanuts. Have a quick taste to see if you need more salt or soy sauce. If you like to pump up the volume for spiciness add a dash of chilli oil. I love this recipe. This is an updated version from the one I posted on BBC food message board years ago. I used quite a lot of dried chillies but I don't find it overly spicy. Frying the spices in oil brings out the flavour of the spices. The chicken pieces are very tender and flavourful. I left all the Sichuan peppercorns with the chicken. They are quite nice biting into, not hard at all with an explosion of lovely flavour and pleasantly numbing sensation. The dried chillies are edible too. Give this a go. I will challenge you not to like it. Glad your computer is working again! Once I made kung po prawns... but instead of large chillies, I used itty bitty very hot chillies. It was almost inedible! I think I'll try your recipe this time with the LARGE chillies. Oh dear no point burning your mouth and worse when you need the powder room :)! 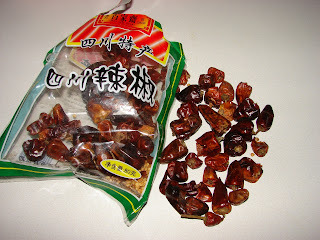 I used the large packet of large dried chillies from Chinese supermarket. There are not very spicy. This is one of my favourite dishes in Asia...and I loved it when I was in Chongqing with my friends who knew where to find some authentic local szechuan outlets...I wish I stayed longer there. I used cashew nuts instead or peanuts. it taste yummy!